The Ballet Folklorico Sol de Fuego recently held a fundraiser at La Casa. The funds will be used to attend workshops and pay for new dresses. The group was started in 1995 by Anamaria and Serafin Chavelas and their friend Ricardo Palomino. Currently there are fifteen dancers, the youngest at age 3, who regularly practice at La Casa and call it their second home. 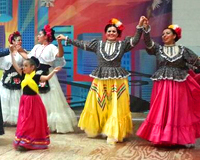 The group performs at all types of event from community events, fundraisers such as the San Gabriel Fiesta and collaborative workshops such as Danzantes Unidos, and private parties. Dancing Folklorico is a great way to encourage our youth to learn more about their culture and get a great workout too!